In a day of Thanksgiving and praise." "these bounties, which are so constantly enjoyed that we are prone to forget the source from which they come, [to which] others have been added, which are of so extraordinary a nature, that they cannot fail to penetrate and soften even the heart which is habitually insensible to the ever watchful providence of Almighty God... They are the gracious gifts of the Most High God, who, while dealing with us in anger for our sins, hath nevertheless remembered mercy. It has seemed to me fit and proper that they should be solemnly, reverently and gratefully acknowledged as with one heart and one voice by the whole American People." 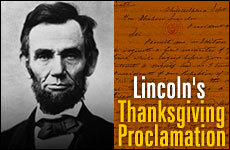 It is worthwhile to read the entire proclamation as we come together to give thanks in a time of troubles, and remember the greater trials of our history. Happy Thanksgiving to all!